Free writing is one of the best ways to prewrite because you sit down and write your final essay without stopping. This answer is incorrect because free writing is a way of getting all of your ideas on paper without stopping, but you will need to organize those ideas and revise significantly for a final product. Which of the following is the last thing you should do before turning a paper in? Hope for the best. This answer is incorrect because we hope you will do more than just hope for the best. We want you to feel confident that you can knock this essay out of the park!Revise for structure and flow of your ideas. 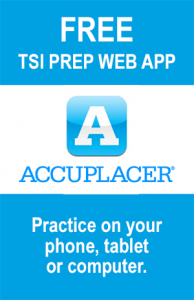 You should revise your work, but this is not the last thing you should do, especially when you are taking a timed test.Cluster your ideas. Nopeâ€”you should have done this as part of your prewriting. It's okay to skip the prewriting step if that's not how you think. No, remember, prewriting is like planning your road trip. Since you are writing an essay for a test, you have a destination in mind. You need to map out how you will get there. Analyze Some Examples We want to give you examples of students' writing processes so you can see what they look like. Read the situation; then, read each example and answer the questions that follow. McDonalds has been an Olympic sponsor for many years, including the 2010 Winter Games in Canada. The theme of that year's campaign was "Eat like an Olympian." 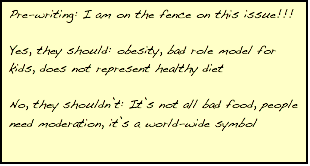 This theme was criticized for sending the wrong message to children about the nutritional value of McDonalds' food, especially since Olympic athletes typically follow strict diets (no hamburgers and fries) when they are training. A nation-wide student group is considering a letter-writing campaign asking McDonalds to step down as an Olympic sponsor. Do you think McDonalds should step down? The Golden Arches have become a symbol of American cuisine— everyone through the world loves McDonalds food. There are limits, however, to how far McDonalds should go in its advertising. McDonalds should not be allowed to sponsor any more Olympic games after its 2010 advertising campaign because it falsely connected its food to athletes' diet and because it sends the wrong message to children during the obesity epidemic. 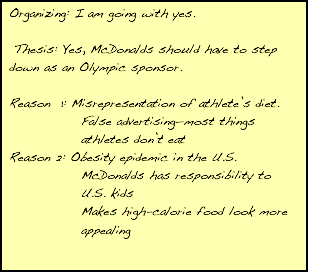 When McDonalds uses the slogan "Eat like an Olympian" in its advertisements, it is misleading the public, and therefore the company should not be an Olympic sponsor. McDonalds is known for its fast food—hamburgers, chicken nuggets, and French fries. These are not the kinds of healthy foods training athletes eat. While they may indulge sometimes, the phrase "Eat like an Olympian" also makes it seem like McDonalds food is something they eat regularly. Nobody can maintain their health with a diet of hamburgers and French fries. Finally, Olympians are regarded as heroes—children and adults idolize them. To associate them with fast food creates a phony connection that can confuse people into thinking fast food is great, and it's what great people eat. A big part of the confusion of McDonalds with athleticism will be from children, which is especially alarming, given the current obesity epidemic. It is clear that obesity has become a major problem among children in part because of their unhealthy diets. Fast food contributes to those unhealthy diets. When McDonalds says it has the food of Olympians, it makes McDonalds food sound less unhealthy than it actually is, particularly to children, who have little to no knowledge of the nutritional value of their meals. Children make nutritional choices based on the kind of emotional factors the Olympic sponsorship creates instead of making them based on nutritional value. McDonalds should be especially aware of this and should not sponsor the Olympics if there is a possibility that they will use slogans like they did in 2010. It simply does not make any sense for restaurant known for its fast food to not only sponsor the Olympics, but to claim that athletes eat its food, as though it's a staple of their diet. McDonalds has misled the public, especially children who are vulnerable and subject to high rates of obesity, long enough. Wanda used the writing process in coming up with her draft. No. Wanda made initial notes, a rough outline, and a rough draft. These are all steps in the writing process. Which of the following is Wanda's most finished version of her thesis statement? a. Yes, McDonalds should have to step down as an Olympic sponsor. b. McDonalds has misled the public, especially children who are vulnerable and subject to high rates of obesity, long enough. c. McDonalds should not be allowed to sponsor any more Olympic games after its 2010 advertising campaign because it falsely connected its food to athletes' diet and because it sends the wrong message to children during the obesity epidemic. SENTENCE A is her thesis in her notes, but it is not her complete thesis, which appears as the last sentence in her introductory paragraph.SENTENCE B is a sentence from her conclusion, but it is not her thesis statement, which appears as the last sentence in her introductory paragraph. Why is it wise to make a list of reasons for both sides, like Wanda did, when you are unsure of how you feel about the issue? a. It helps you figure out which topic you have the most to say about. b. It helps you define the issues in the topic. c. It helps you brainstorm all of the possible reasons you might cover. McDonalds is a corporation almost anyone can recognize, whether it's for their food or their charitable work. This multi-national corporation has been an Olympic sponsor for decades and is responsible for the development of the Olympic Village, where athletes from all over the world live and work comfortably during the games. McDonalds should continue to be an Olympic sponsor because there is nothing wrong with the "Eat like an Olympian" campaign; it's not McDonalds job to police what people eat, and there are perfectly healthy options available at the restaurant. 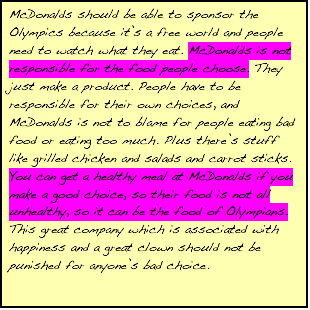 McDonalds can and should us its billions of dollars to sponsor the Olympics and can use slogans like "Eat like an Olympian" because it is not responsible for people's choices. Olympians can and do eat foods like the ones offered at McDonalds; they probably do it in moderation, and they exercise. It is okay for even a world-class athlete to have a hamburger, French fries, or even ice cream once in a while. Fast food is dangerous only to people who eat too much of it or eat it too regularly, and these people need to change their habits. McDonalds is not responsible for how they choose to eat. Even if folks do choose McDonalds for their meal, there are healthy options on their menu, so McDonalds should be an Olympic sponsor. Because of federal laws, McDonalds puts nutritional information on their menus and packaging so people know the nutritional value of what they are eating. If they are concerned about calories, they can choose a salad, wraps, or diet sodas instead of other, more fattening menu items. McDonalds even points out lower-calorie items and smaller-portioned items on its menu. This could be said to actually encourage customers to pick healthier options. McDonalds has also recently redone their kids meals, making them healthier. They now offer a vegetable or apple alternative to French fries, and a skim milk alternative to soda. Again, it seems like McDonalds is actually encouraging healthier eating, so it actually should be an Olympic sponsor. It's okay for McDonalds to sponsor the Olympics. Ralph used the writing process in coming up with his draft essay. No. Ralph made initial notes, a rough outline, and a rough draft. These are all steps in the writing process. Which method did Ralph use to get his thoughts together? Clustering involves making groups or "clusters" of related ideas on a page"Outlining involves making a kind of list of main ideas and subtopics. Why did Ralph highlight the two sentences in purple? a. He left those ideas out of his rough draft. b. He liked those ideas, but he thought they were too off-topic to include in his rough draft. c. He thought one of those ideas should be his thesis. d. He thought those two ideas would make great body paragraphs for his draft essay.